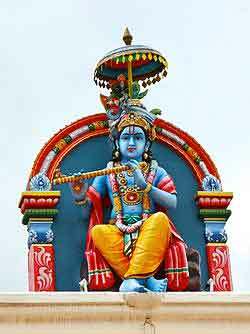 Krishna is the eighth avatar of Lord Vishnu and one of the most widely revered and most popular of all Indian divinities. Krishna is mostly depicted as an infant eating butter (makkhana), a boy holding a flute standing with Radha or an elder showing the way to Arjuna, as described in Bhagvada Gita. There are a lot of legends about Krishna's mischievousness and bravery. 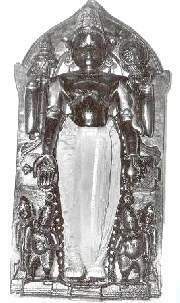 It is said that he was the Poorna avatar of Lord Vishnu, thus, possessing similar powers to the Supreme Lord. There is a legend about Krishna that once he rescued the whole village from the serpent Kaliya living at the bottom of the river Yamuna by making the serpent surrender in front of him. Another legend says that he again saved the villagers from a big famine when there was no rain in the region from a long time. He suggested the villagers to worship the Govardhan hill instead of Indra, which made Indra very angry and he sent a storm to the village. In order to save the villagers, Krishna held the Govardhan hill on his little finger and gave all the villagers a shelter. He narrated Bhagvada Gita to Pandava prince, Arjuna to counsel him for the big fight, Mahabharata. Krishna has always rescued his devotees and has always shown them the right way. Krishna is worshipped all over the world and has a number of temples. 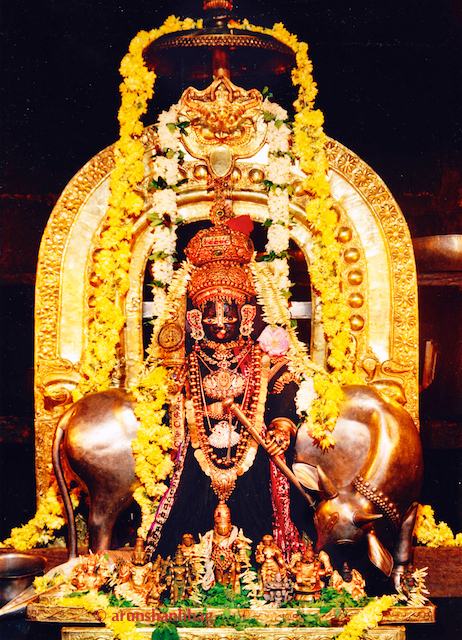 A famous temple of Krishna is the ISKCON temple having branches almost everywhere. Located in Gujarat, Dwarkadish temple is a renowned temple where Lord Vishnu slew the demon Shankhasura. Another significant temple is in Vrindavan, which is considered to be the childhood home of Krishna. Some other famous temples of Krishna are Jugal Kishore Temple located in Mathura city (birthplace of Krishna), Jagannath Temple in Puri (Orissa) and Guruvayur Temple called as the Dwarka of the South. Krishna is mostly worshipped with Radha and includes chanting of the mantra Hare Krishna, Hare Krishna, Krishna Krishna, Hare Hare Hare Rama, Hare Rama, Rama Rama, HareHare. Chanting this mantra gives immense peace and inner power to get through the difficult phases of life. It gets you closer to the Lord and will bring happiness and prosperity.